on Urbanspoon ain’t even cutting it! Service, is, to be honest – at the bottom of my list. Fresh off the bat, for me, it’s Cleanliness, Food, Value then, Service – which explains why I don’t talk about it too much compared to other Food Bloggers out there. 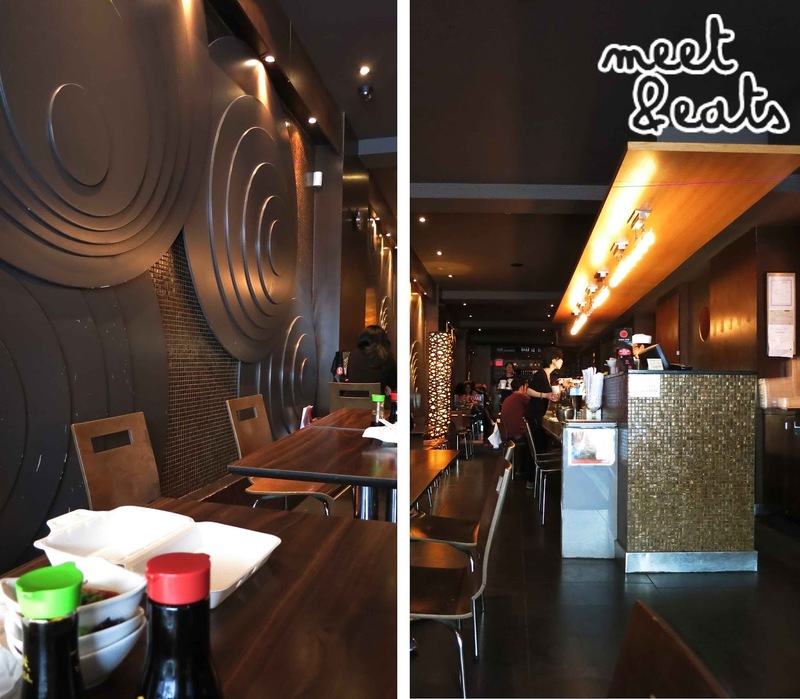 Having been dining in the Sydney West areas growing up, it’s not surprising to not receive mid-meal check-ups and a conversation. My sister and I were still full up to the arvo after the feast at my Uncle’s house. It was 2:30, walking down Queen Street and we were popping into shops on the way down to Eaton’s, looking for a place to eat. We were attracted by two A4 sheets stuck outside a restaurant window. But I, mainly appealed to the ‘$7.99’. So, they had two options, and five options in either two options! Oh boy, this is a hard choice! Just to note – Harami (this is the first time I’ve heard this term too!) is Salmon Belly (UM, YUM.) and if you don’t know, a Croquette is a Fried Potato Ball/ish☺. Our sides and complimentary dish came 10-15 minutes after ordering. We were happy to see this come to our table. 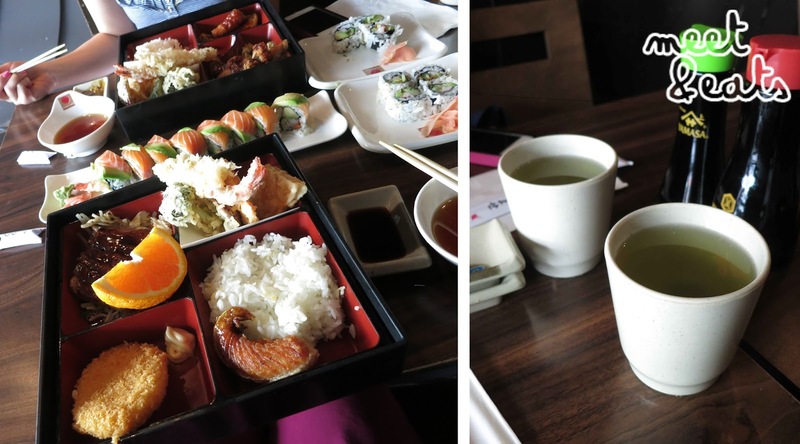 I think we received a plate of these cuties because we both ordered a Bento box – not sure – but no complaints! These cute peas are immature soybeans, boiled and sprinkled with salt a pepper! Always a nice treat ☺. And, 10 minutes after- why, heeelllo! Okay, the Salmon Belly (Harami) in my sister’s Bento looked incredible! And it did, exactly, taste incredible! My bento – I was so excited to see such an amount of Tempura! 1. 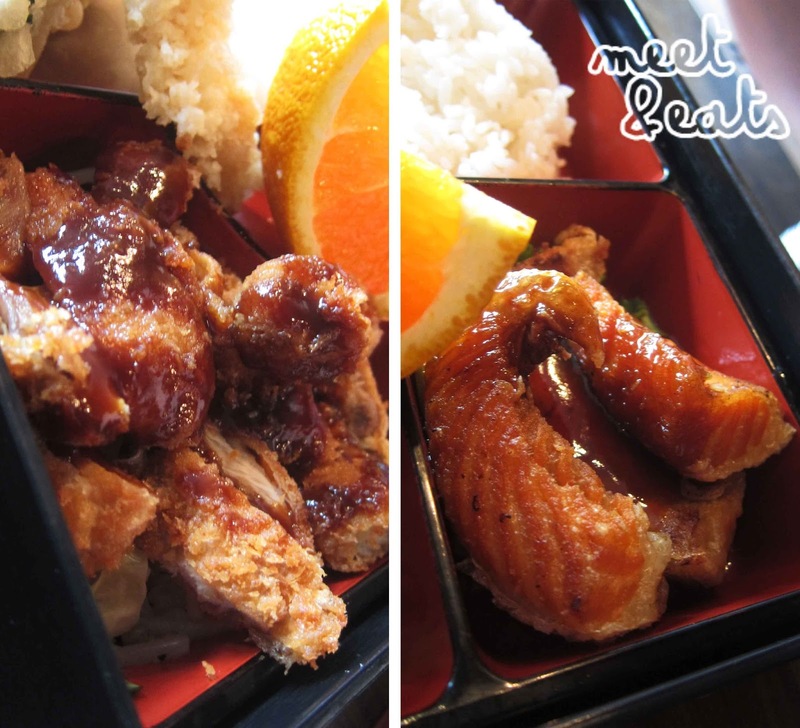 Katsu Chicken – A big plain ol’ average! 2. Harami – Salmon Belly – It’s crisp on the outside, and has a delicious amount of fat. Omg. 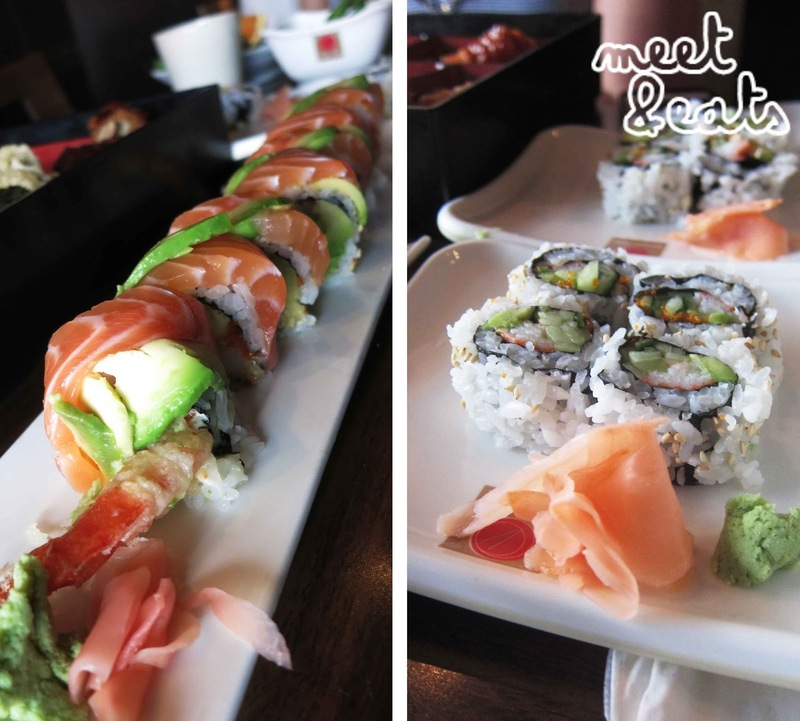 Not the melt-in-your-mouth craving for more pieces of sushi you would expect. Even the ginger pieces weren’t fresh. This was apart of our Bento boxes! We received four pieces each.The California roll wasn’t tasty at all though – nothing was right! I didn’t want another piece. Oh – and did you guys know that Japanese restaurants have two types of soy sauces available at the table! The green-lidded bottle being low-sodium! That’s mighty generous of them! Overall, the big winners for me were the Harami (Salmon Belly) and the Tempura pieces (as always)! 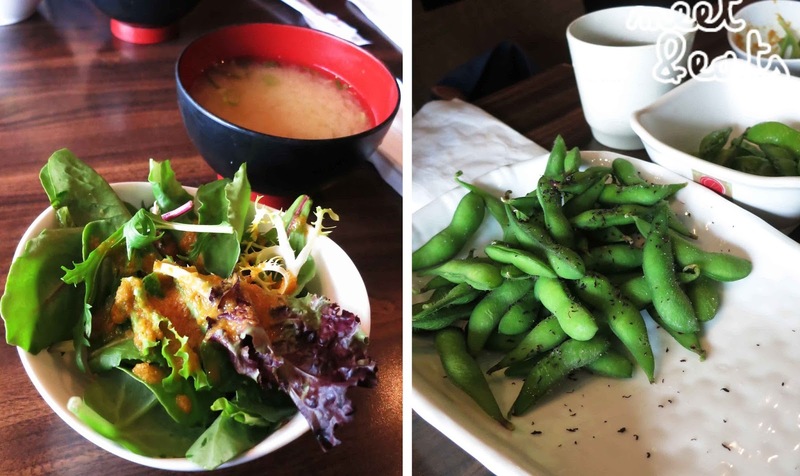 The complimentary Edamame didn’t even have the bite you’d expect. Next time, I would go for the Harami, Katsu Pork & Shrimp Tempura instead. Great value of a bento box for only $7.99! But, do not order their sushi rolls. They’re not very good at all, and did you see that piece of pickled ginger? – Their sushi. No thank you.